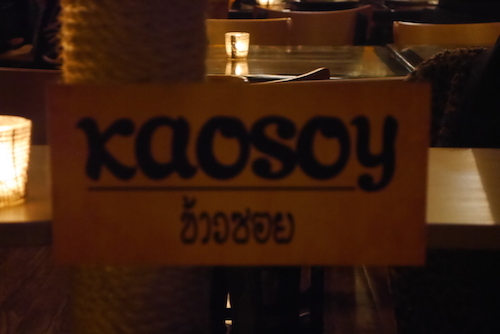 On a Wednesday about two months after opening, I walked by Kao Soy as I waited for friends to arrive at 19:30 and the place was completely empty. The owner/chef Kanlaya Supachana rose from her chair to tell me that alcohol was not being served yet unfortunately, while they waited on a liquor license. I retreated to a bar across the street and returned as a group of three an hour later to find the place full, every table occupied. Since I had heard good things, I was terribly disappointed with the lack of business before and very happy to find things going well later. We grabbed the only available spots, at the no legroom bar, and settled in for our meal, with the aromas of good Thai food surrounding us. 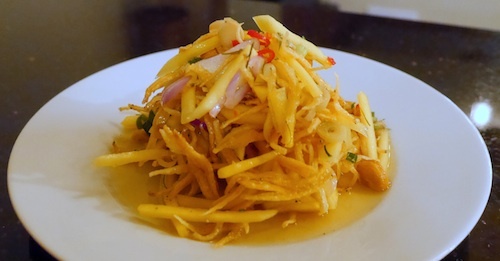 Our first appetizer of the evening was the sweet and spicy yum pla ka tuk ($10, below), an anchovy salad made with crispy fried fish and thin cuts of fresh mango. The small peppers and thin sauce really set our mouths on fire and we all looked at each other in recognition of real Thai food in Brooklyn. The tiny fish may or may not remind you of anchovies, but no matter. Rare cuts of marinated beef, slightly on the chewy side make up the focal point of yum nuer ($9, below). 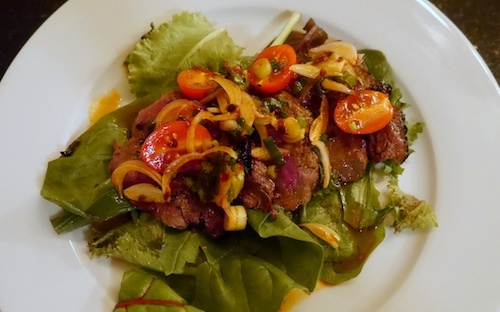 The cuts of sirloin are laid over a bed of lettuce and covered with shallot, tomato, watercress, and scallion. The chili paste and squeeze of lime really stand out after a few chews. 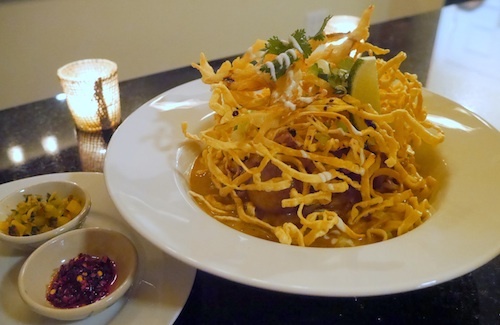 Our eyes all got bigger when presented with the yum som-o ($10, below), a knock-your-socks-off salad of pomelo that packs an explosion of spice in each wet bite. 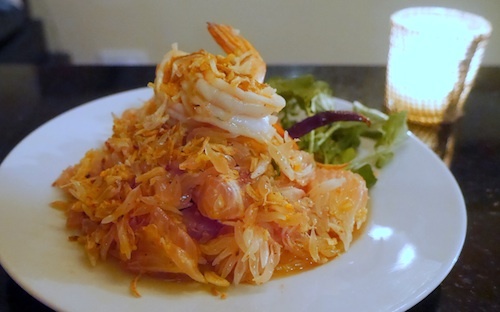 Packed into this array of textures and tastes is peanut, crispy shallot, baked coconut and watercress, while two healthy fresh shrimp adorn the top like the star on a Christmas tree. The namesake dish of kao soy ($12, below) had to be ordered out of deference to the restaurant, and despite not being universally praised in our group, was my favorite entree of the evening. Soft egg noodles hide below in a sweet Chiang Mai curry that is thick with coconut milk. Fried egg noodles and papaya fritters top this and the two succulent drumsticks below to make a virtual bird's nest and a beautiful dish. In northern and northeast Thailand it is hard to avoid eating a lot of sausage, and we succumbed to the lure of sai-oua ($14, below), a very herbal pork sausage that also comes with fried marinated pork jerky. The green chili sauce is great for dipping, and does enough to counterbalance the dryness of the sausage itself. 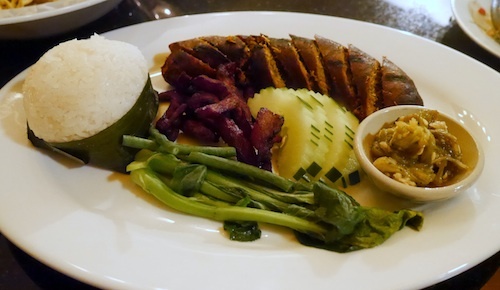 This comes with a side of sticky rice and mustard greens. Our final dish was the kang hung le ($14, below), another northern specialty, a stew of pork belly and top round. 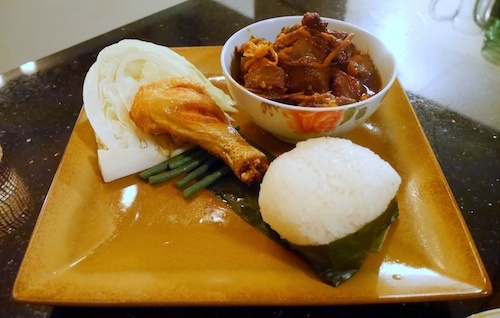 The dish itself is full of flavor and maybe a tad on the salty side, but more sticky rice is able to balance this. A drumstick is also on the plate on its own, but this is fried as compared to those in the kao soy, and made me want to have about five more it is so delicious. Three meats on one plate might normally have a hard time getting along, but that is no problem here. So now the borough of Queens, until now the only real bastion of quality food from Thailand, has got a run for its money on its hands. It will take repeat visits to make sure everything here stays at the top of its game, but please go and see for yourself. Something special is cooking and is worth the effort that getting to Red Hook takes.